The NBB-20VS16-3 includes a robust selection of monitoring features, including event alarms and SNMP polling to help you keep tabs on vital network elements, avoid costly service calls and maximize up time. The NBB-20VS16-3 features a 16 Amp input, (20) twenty remote switched IEC C13 outlets and (4) four 16 Amp UL-489 circuit breakers. Each circuit breaker protects 5 IEC C13 outlets and supports up to 16 Amps. 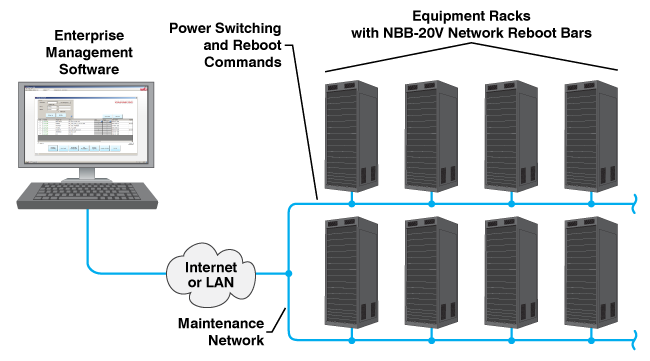 The NBB-20VS16-3 is built for vertical Zero U (0U) installations where rack space is limited. Mounting kits are available to fit a variety of rack and closet enclosures. The NBB-20VS16-3 can also perform remote reboots and power shutdowns on individual outlets according to a user-defined schedule, when a ping command fails or on demand. The NBB-20VS16-3 can be configured and operated via its convenient IP web browser interface or by any SNMP MIB based enterprise management software. To see a complete list of approved management software, or to recommend additional software or compatibility testing, please see our Software Integration section.